Gearbox Software wants you to know that it's listening. No, not in a creepy "peeking through your window and listening to the songs you sing in the shower" kind of way. More like in the "We want to make Borderlands 2 the best game it can be" kind of way. The developer has launched a player survey concerning what you loved most about its cooperative shooter, even giving those who choose to provide their names a chance to win some Borderlands goodies. Questions like what platform did you play it on, did you use and play split-screen, and what add-on content did you buy are all posed. They're also asking you to choose what's most important to you in the game: weapons, character classes and skills, enemies, bosses, vehicles, or story. If enough of you don't choose "story," then former Destructoid writer Anthony Burch could be out of a job, so consider this carefully, okay? Additionally, in the case that there were a Borderlands 2 collector's edition -- and Gearbox isn't saying there will be, this is just a hypothetical (Editor's note: C'mon, there totally will be) -- what would you like to see in it? 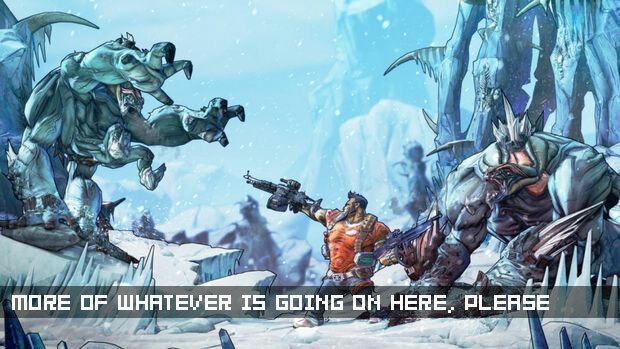 Gearbox says its listening, so comment and let 'em know.